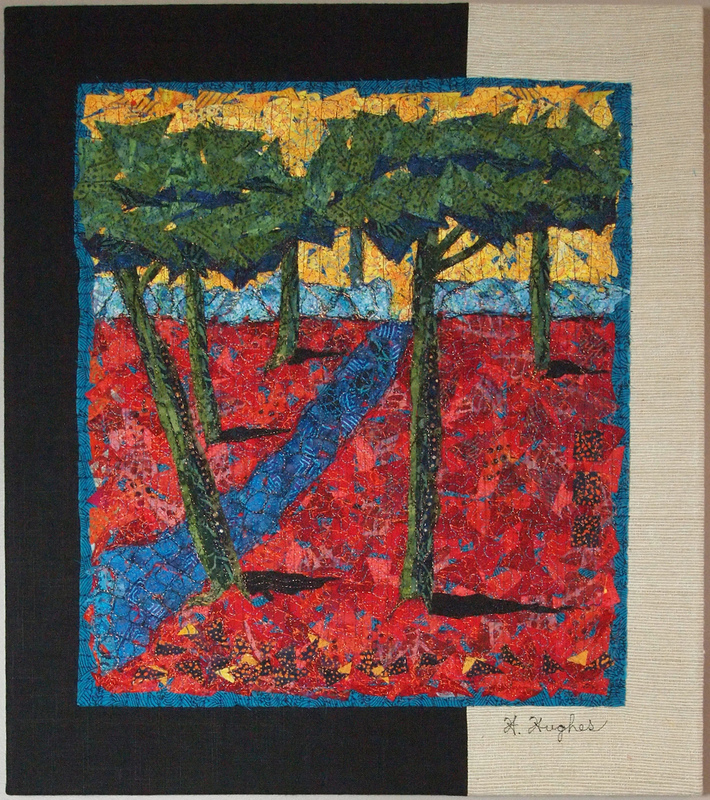 Works made primarily of textiles and/or paper, usually stitched by hand or machine, possibly but not necessarily quilted. Our members have been very busy! 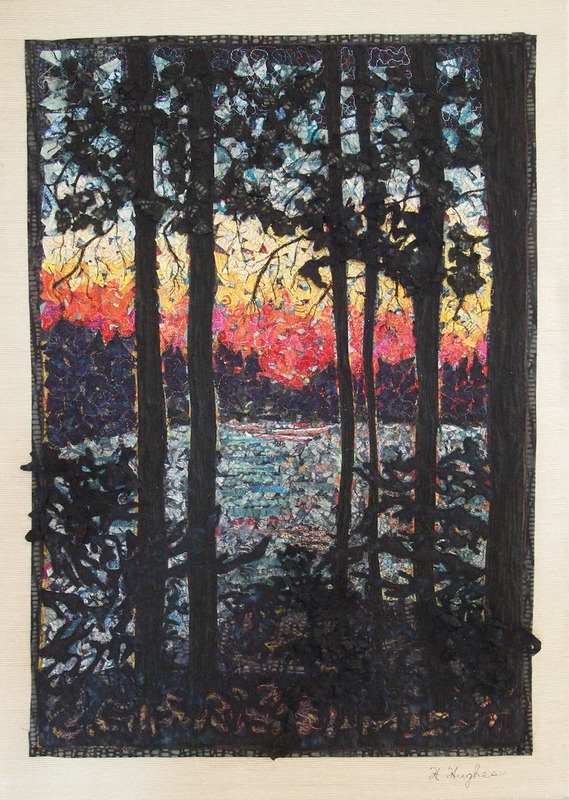 First of all, don’t miss the opening of the latest show by Connections Fibre Artists, titled Celebrating the Group of Seven, which includes work by our own Helen Hughes. 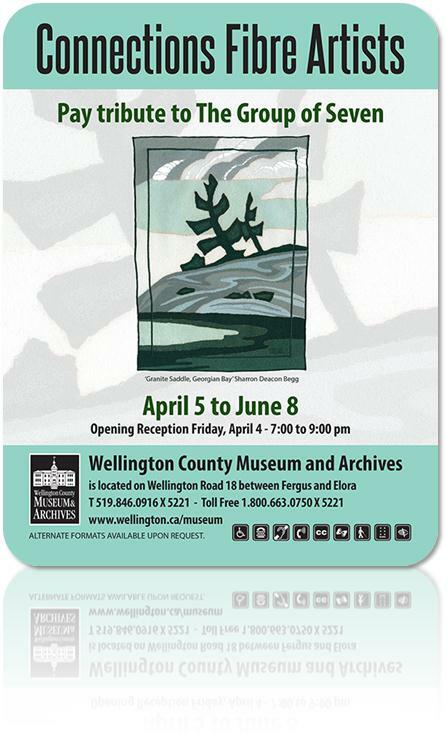 It runs from April 5 to June 8 at Wellington County Museum, and the opening reception is on Friday April 4th, from 7 to 9 p.m. 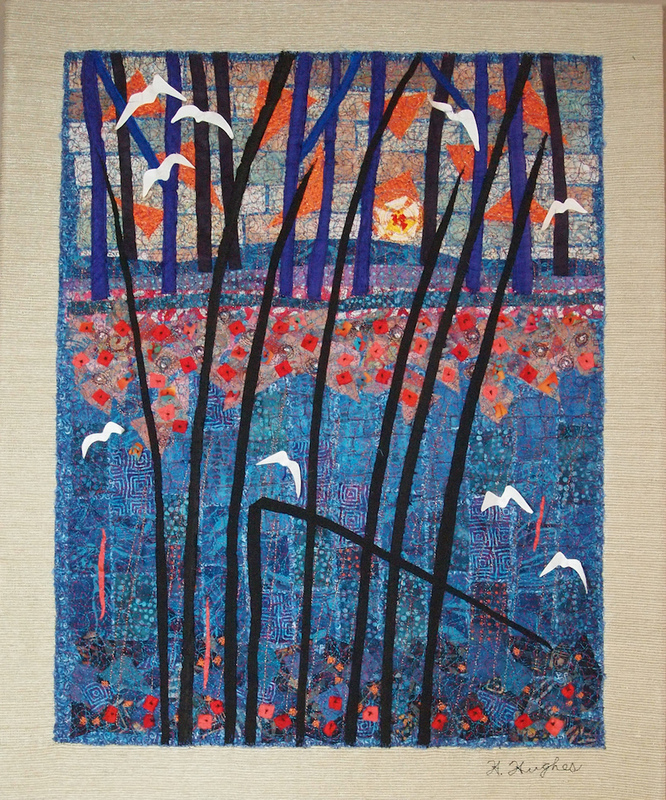 If you want to see a spectacular Tom Thomson type work in textile, don’t miss this piece by Helen. The Museum charges a nominal entrance fee during regular daily open hours, but no fee is charged the evening of the opening. So that’s a good time to go! 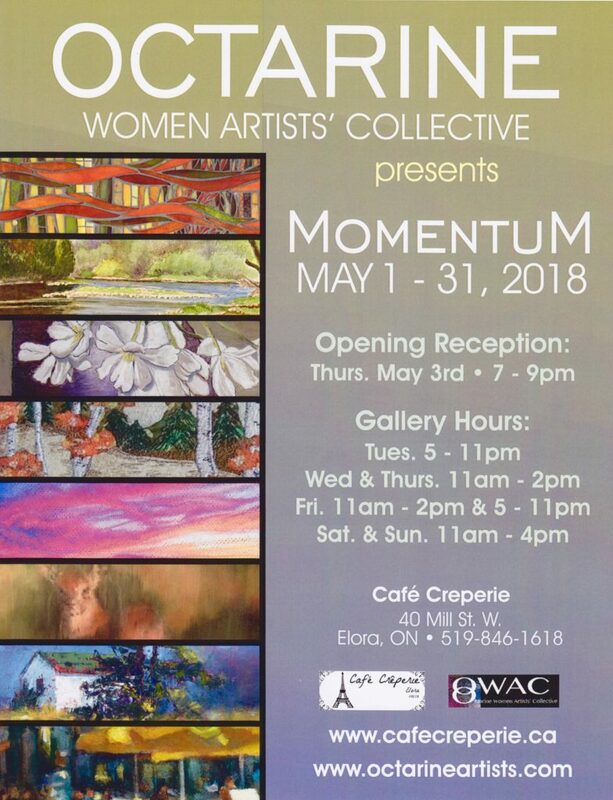 Another show, which involves work by Helen, Deb and Leslie, will open this week of March 24th, at the Boathouse on Gordon St in Guelph, and it will be up until the first week of June. This show represents current art of the Studio Tour membership. Just longing for Spring? Seen any robins? Well, they’re coming! 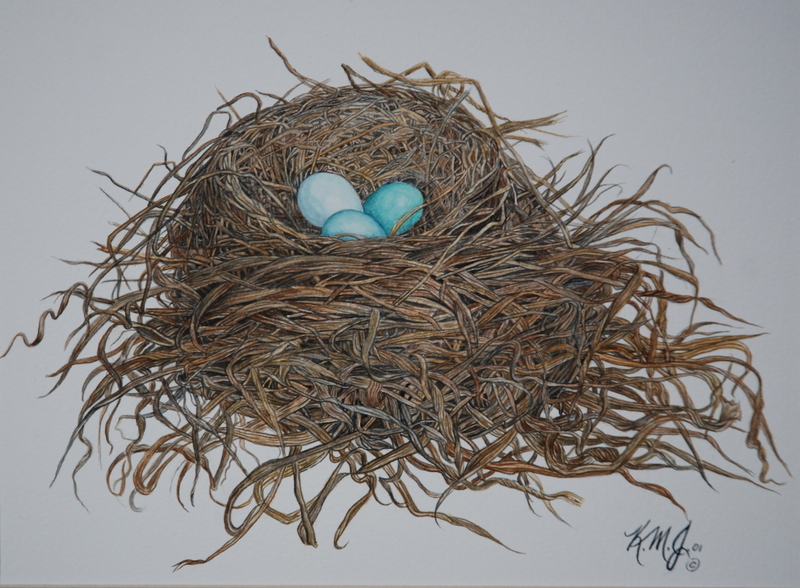 Here is a lovely watercolour by Kim Johnston, which is currently included in her solo show in the main lobby of Groves Memorial Hospital, Fergus, as part of Art in Public Places (organized by the Elora Arts Council.) Kim’s work will be there until the end of April. Susan studied Philosophy and History of Art at Leeds University (BA Hons), and Design and Craft with the City & Guilds Institute of London (Level 3 Diploma). 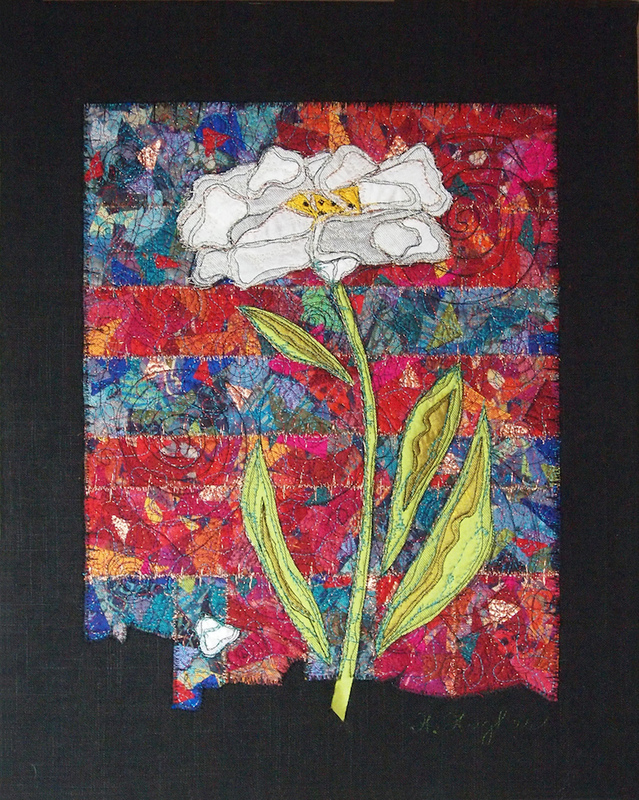 Having been a painter all her life, she has also worked in fibre art since 2003. 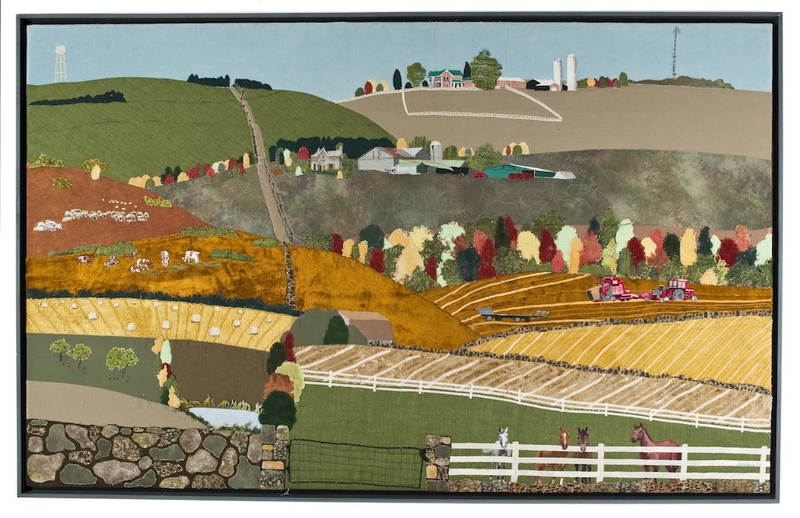 Among many other juried shows, she has shown by invitation at the 2003 Biennale in Florence, Threadworks 2004 and 2007, and the Grand National Quilt Show in 2004, 2005, 2006, 2007 and 2013. 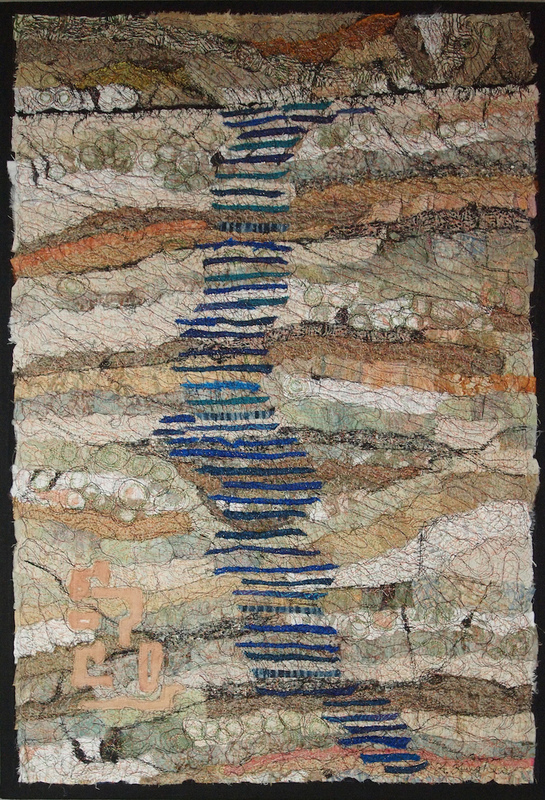 Awards include Best in Show in Threadworks 2004, the Fibre Art award at Insights (2006), and the Rebecca Burghardt Emerging Artist Award at Touched by Fire (2008). Susan teaches workshops in fibre art techniques throughout Southern Ontario, and also offers private instruction in her studio, though her popular “Play for a Day” getaways. 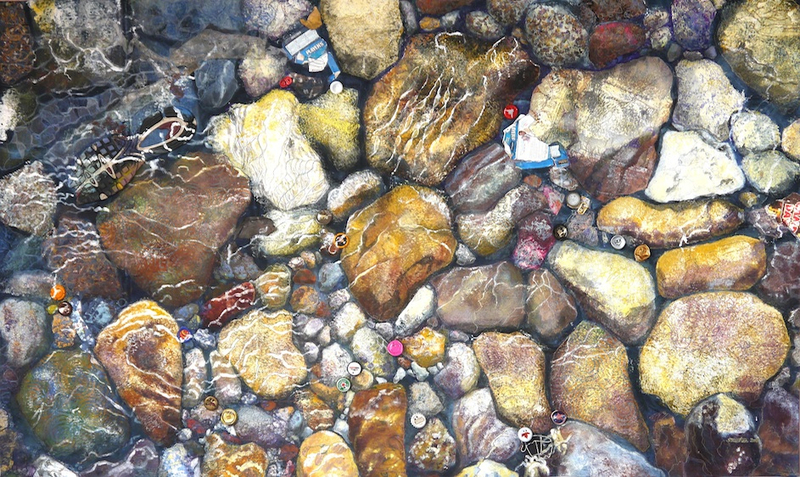 In addition to working in fibre, Susan accepts mural and church commissions, and paints portraits in watercolour and other media from photographs. My work is inspired by nature and the landscape around my home: I am an avid environmentalist. 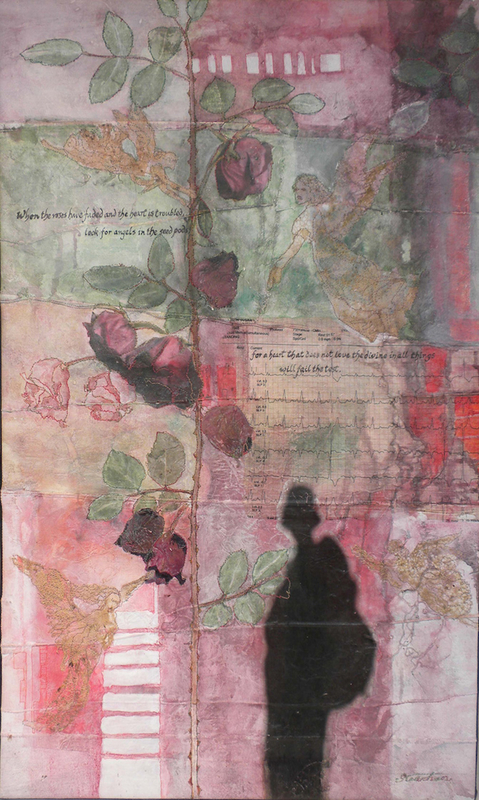 I work with distressed fibres, paper-and-textile combinations, and found objects; I also paint and dye my own materials. Recently my work has been increasingly realistic, and I have focused more on line and colour than stitch. Increasingly I am happy to just observe things; I often use shadows of myself to reinforce my role as a watcher, seeking not only to portray my surroundings, but also to comment upon them. 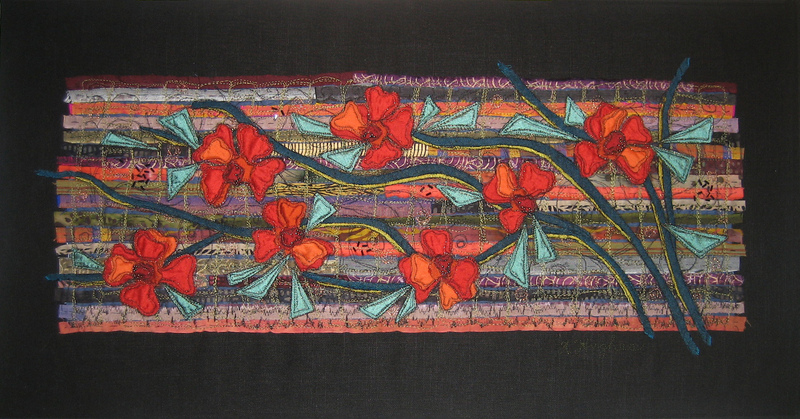 Helen Hughes, a textile artist living in Guelph, studied Fine Art at the University of Guelph, graduating in 1978 with a B.A. in Fine Art and Music. Studies continued through a summer semester in New York with workshops and hands-on experience with sculpture and large public installations of art. 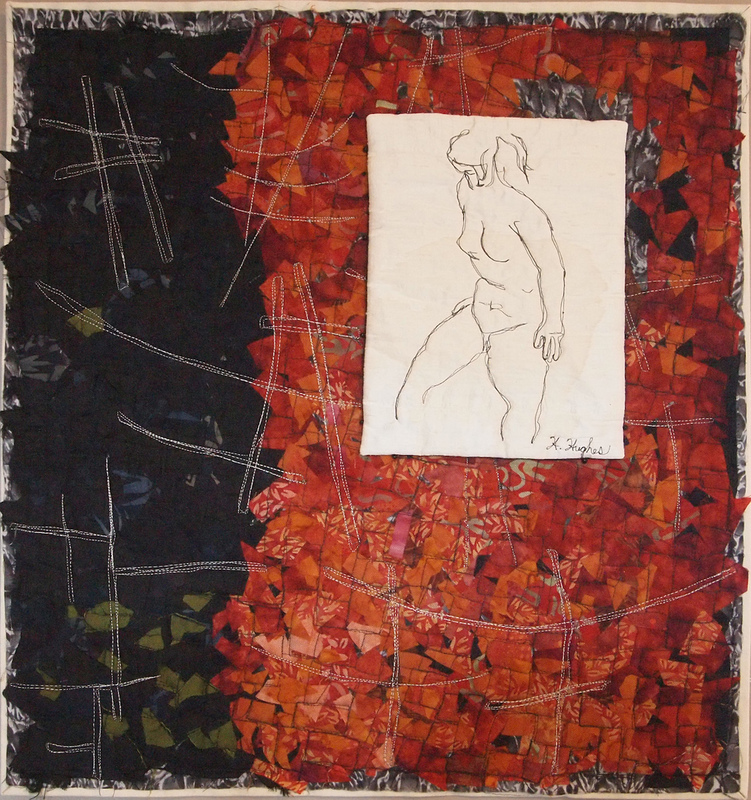 Painting, printmaking and sculpture have shaped her artistic path, but textiles have become her defining medium for over 35 years. 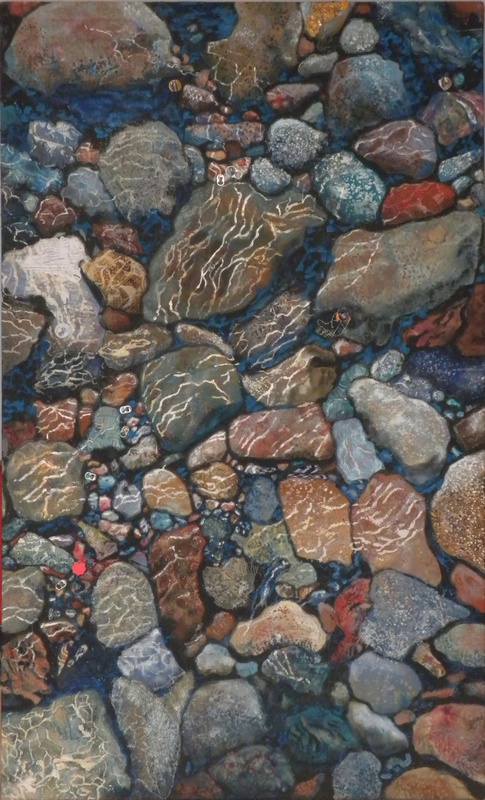 Helen has been exhibiting her work regularly in galleries and museums, both locally and nationally since 1978 in both invitational and juried shows. 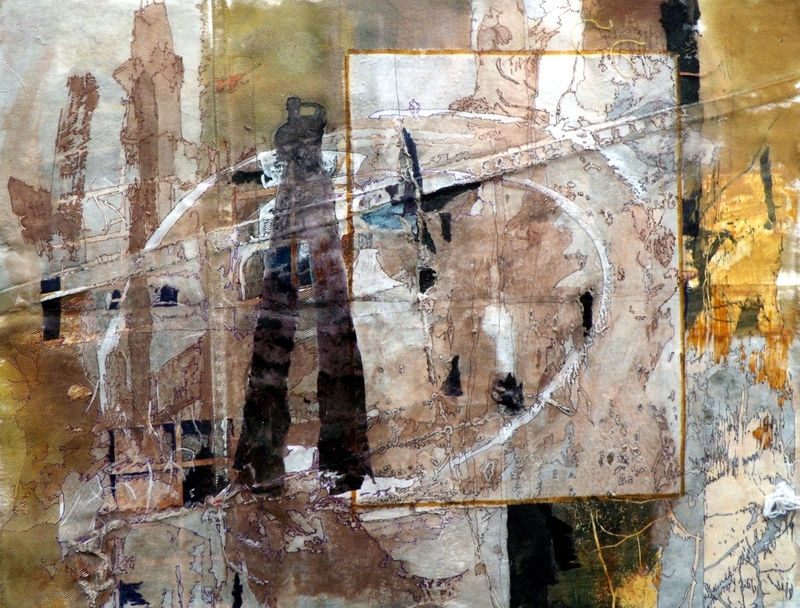 She furthers her artistic expansion through workshops with many internationally acclaimed textile artists from Canada, Europe, United States, England, South Africa, Japan and Scandinavia. 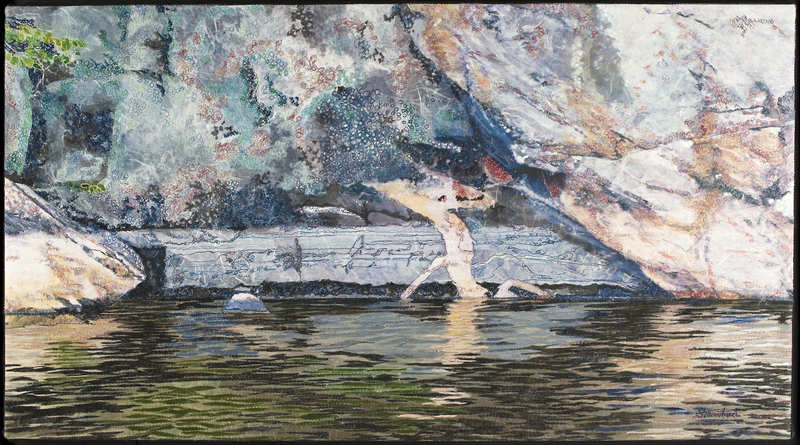 Her work is in private collections around the world and in public buildings in Ontario. Helen presents lectures on Contemporary Fibre Art, and workshops to guilds, groups, schools and through the Art Workshops in Elora. She operates her business ‘Silver Needle Designs’ from her home studio and produces original textile compositions using primarily silk and her hand–dyed textiles of linen, cotton and wool. Her art has been featured in Canadian and international publications. 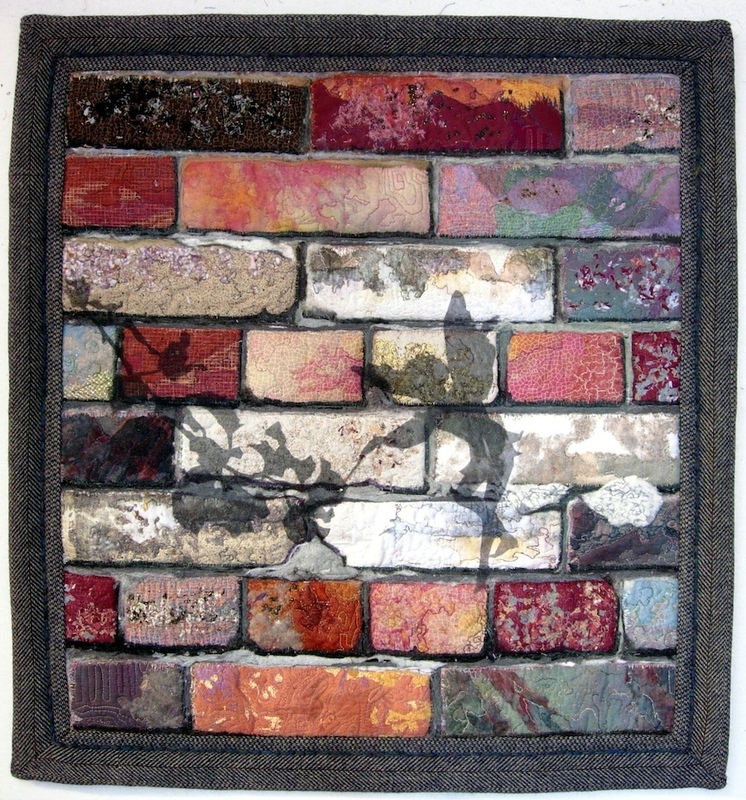 Helen is a member of the Guelph Studio Tour and Connections Fibre Artists, an international group. She is an active volunteer with the Huntington Society of Canada, which is a major part of the fabric of her life. 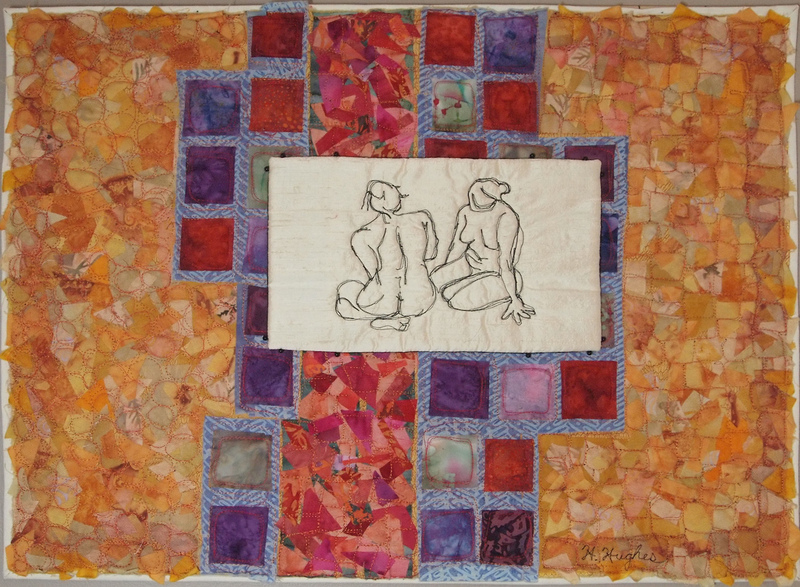 Artist Statement: Textiles, as an artistic medium, have allowed me to give the best expression of my personal vision. Inspiration and motivation come from a vast array of sources. Pushing new techniques and exploring surface design help me translate my view of the world into cloth. A continued fascination with colour and pattern informs my work, and my goal is to nourish spirit, eye and mind in equal measure. Passion drives me forward as I celebrate a life in textiles.